Let’s be real: choosing furniture for your home is stressful. Exciting, yes. But stressful. Our homes are our places of refuge and we take pride in how they look. Nailing down the look can be a little overwhelming. If you’ve caught yourself in the Pinterest scrolling death-spiral, you’re not alone. Are you a minimalist? A bohemian? A mid-century modernist? None of the above!? It can be tough to know what term defines your style. Here’s the good news: there’s no wrong way to design a home. But direction helps. Here are our best tips to tap into your inner stylist and make your space the Insta-worthy palace of your dreams. Before choosing furniture for your home, first ask yourself how you want those spaces to feel. Comfy in your living room? Relaxed in your bedroom? Energized in your kitchen? Each of those feelings have corresponding colors, textures and shapes. By identifying the way you want to feel in your space, you can narrow down your inspiration-pics to the most relevant. That brings us to our next step: pick pieces that build the feeling you’re aiming for. If you want your living room to feel cozy and lived-in, opt for soft fabrics, warm colors, and lamps for gentle lighting. Or if you want your room to feel elevated and minimal, pick pieces with clean, sharp lines like the Parker sofa line. Accessorizing with a few metal and marble pieces will add visual interest without crowding your space. 17Apart’s Charme Tan Thetis chairs look beautiful in her neutral living room. Mary Vidar of 17Apart knows the challenge of starting a room from scratch. When she and her husband Tim decided to makeover their downstairs living room, they needed to think of a style-solution that would serve them long-term. “We… set out to design a room we want to spend time in, with pieces that beg us to come sit, relax and unwind. We didn’t want anything that felt stuffy or formal,” says Mary. To achieve that feeling, she and Tim opted for easy, comfortable seating and a soft palette. Build Around a Focal Object. Don’t worry about everything being perfect. Instead, focus on finding pieces that you genuinely love. A statement piece, such as the Lina rug or Emil sectional in a fun color — and build your room around that best-loved piece. From here, it’s as easy as finding furniture and accessories that match the focal piece’s colors and mood. 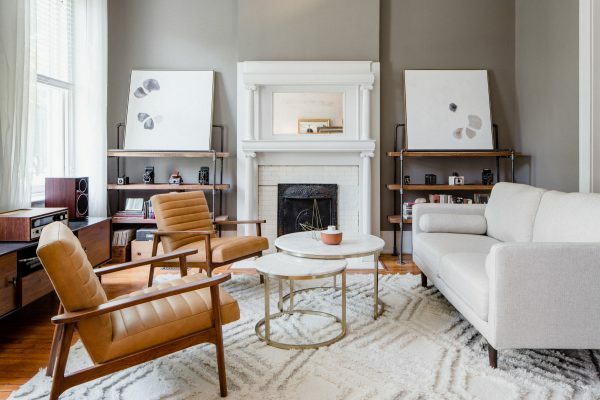 For instance, if your statement couch speaks to a Mad Men aesthetic, round out the space with mid-century-inspired pieces, such as teak furniture and mod art prints. 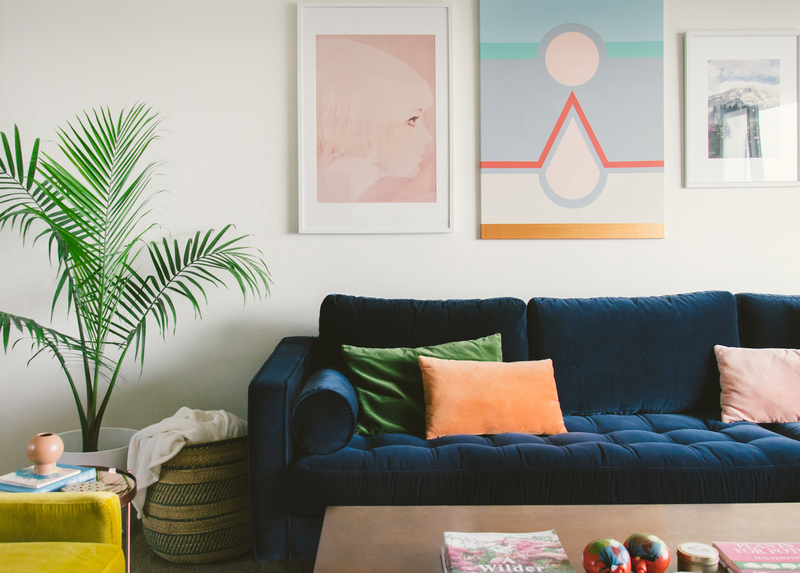 Jenni of ISpyDIY recently updated her living room with a Nirvana Leather sofa — but when you look at her space, you’ll notice that the colors and vibe are largely influenced by her rad artwork. 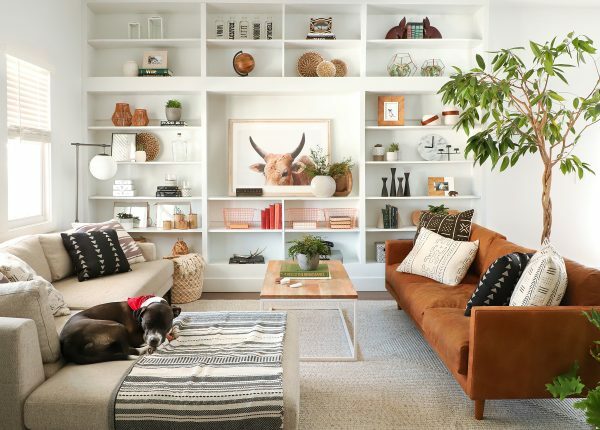 Neutrals, mudcloth pillows, red-earth tones, and greenery echo are repeated throughout the space, but are anchored by the bull print. ISpyDIY‘s decor is grounded in her leather Nirvana sofa. (Bonus tip: check out #ourArticle on Instagram to see how other DIY designers have styled their articles). Color can bring a lot to a space, whether that’s setting a specific mood or accenting existing pieces of furniture. Working out your color scheme — the set of colors used in one room — will help get the mood of your room just right. Pairing neutrals like white, beige and brown with pops of bright colors gives off a mod, mid-century vibe. Warm colors like yellow, red and orange feel cozy and personal, while cool colours like blue and green add a sense of calmness to a room. Being mindful with your color scheme is an easy way to upgrade a room — but there’s no need to stress about matching. A pink accent chair ≠ bubble-gum pink tween bedroom (unless that’s what you’re going for, of course). Instead, use neutrals to balance bright colors. For a bolder vibe, look across the color wheel and accessorize with contrasting yellow, green, or teal hues. A quick lesson on mixing colors: hues that are opposite from each other on the wheel, like blue and orange or red and green, are known as complimentary colors. When used together, they create eye-catching contrast. Another color-blocking method is using triadic schemes, or choosing three colors equally spaced from one another on the color wheel, like orange, purple and green. Triadic schemes feel a little more balanced and harmonious than high-contrast complimentary schemes. To gain inspiration before committing to a scheme for your space, try browsing color palette websites like ColourLovers. The team over at CitySage are masters of color experimentation. In a recent project, they splashed out on colors while managing to keep the palette controlled. 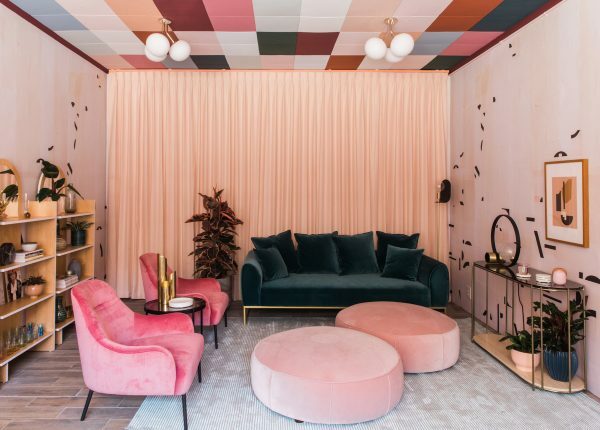 With tones of teal, peach, pink, and differently toned wood, the designers managed to create depth in the space by using different textures in similar hues. City and Sage designed this colorful office space for their client using some of their favorite Article velvets. Don’t be afraid to mix up patterns, either. Making multiple patterns work is as simple as finding a common color thread between them. The monochrome of our Dark Gray Fleck Mali rug, for example, would work with the eyelet pattern in the Bamba pouf or Grays Momo pillow. Instantly lighten up your space by adding elegant storage pieces. Sideboards like the Seno aren’t just pretty to look at — they seamlessly tuck away any clutter that you don’t want guests (or Instagram followers) to see. Gallery walls that feature a mishmash of framed art and photos, or accessory clocks like the Maris, are a popular way to fill out the empty wall space above a sideboard. The top of the sideboard itself is a great place to display stacks of your favorite books, flowers or eye-catching antiques. Mandi Johnson of Making Nice in the Midwest kept her study clean without sacrificing function by installing some DIY storage boxes painted the same color as her walls. 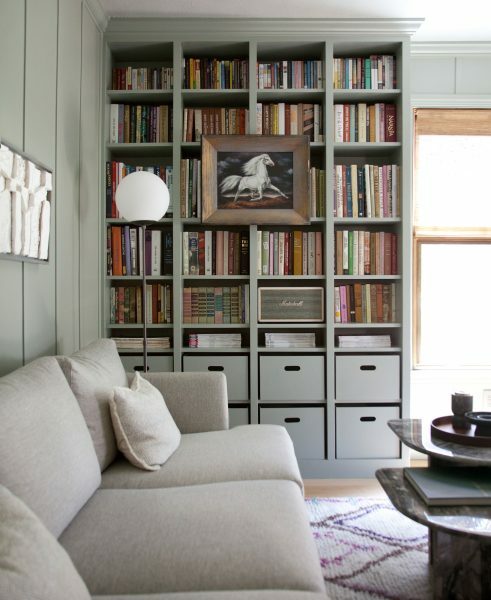 The cool tone keeps the room feeling cohesive, while the carefully chosen book selection introduces subtle color to the space. Making Nice in the Midwest matched her storage to her wall color to make for a more cohesive look. PS: Nice Burrard sofa. Small, yet aesthetically pleasing organizers also help fill out a space while tucking mess away. Think: woven baskets, magazine racks or coffee tables with drawers. Efficient furniture like this is perfect for those days when your busy lifestyle gets in the way of your minimalist aesthetic. Searching out unique fabric textures adds next-level depth that’s hard to do with color alone. A space decked-out in shiny-sleek leather furniture will feel a lot different than a living room full of plush upholstery, for example. Never underestimate the power of a couch. It’s likely the piece of furniture that you spend the most time on besides your bed, and it holds significant visual weight in your living room. Luxuriously upholstered couches like this one are especially comfortable and inviting. If you’re looking to experiment with texture, try out the retro-lux velvet upholstery of the Nord chair. 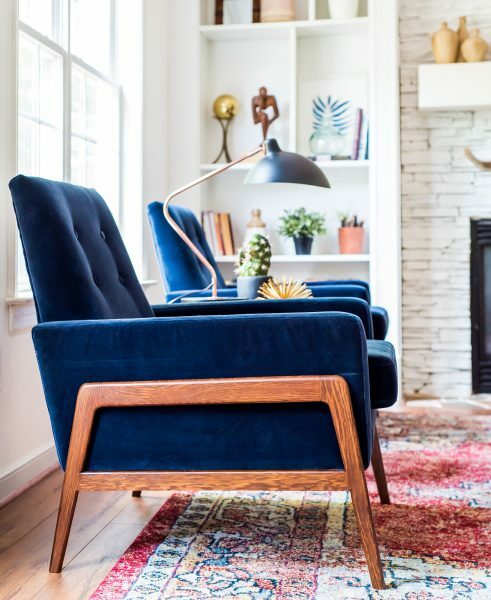 The Nord chair in blue velvet brings a fresh burst of color to A Place of My Taste’s cool, neutral space (rhyming unintentional, but welcome). Leather is a popular couch fabric simply because it’s so easy to style. It’s the perfect neutral backdrop to whatever prints, rugs or patterns you accessorize your space with, while taking on its own unique worn qualities. The mid-century charmer Sven is our bestselling couch and takes on its own color variations, wrinkles, and creases over time. Accents like the Timpani leather ottoman are another great way to dip your toes into the (accessibly) luxurious world of fine leather goods. There are infinite directions you can take when choosing furniture for your home. A word to the wise: keeping a few easy guidelines in mind when picking your articles, whether online or in person, will make your experience more empowering than exhausting. Don’t know your anilines from grains? Check out our post to brush up on your leather lingo — and find your perfect leather article. With that, go forth and get designing!